Sit back and relax with Kinderlime's comprehensive billing system. Create charges, send invoices automatically, and even collect payments on a schedule. 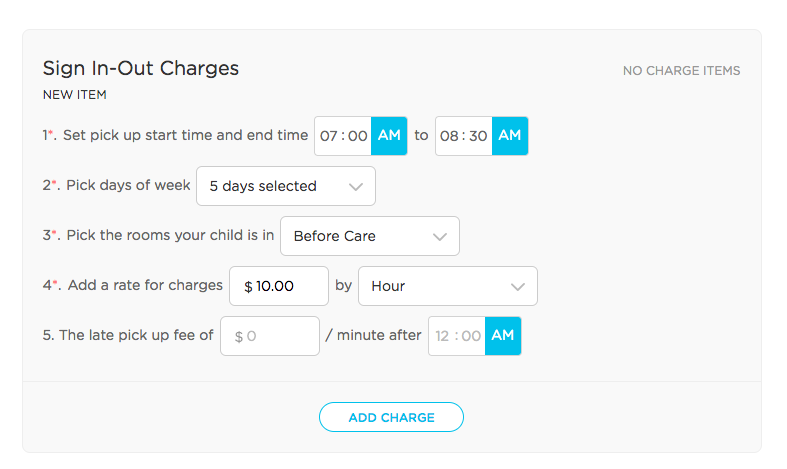 Now you can assign children multiple charges and even set up criteria to collect late pickup fees when a parent picks up after closing! Do you bill for drop-in care? No more wading through stacks of sign in-out sheets to calculate what is owed -- Kinderlime can bill based on attendance! Tuition-based plans cover charges that are the same each month regardless of how the student attends (flat-rate /tuition). 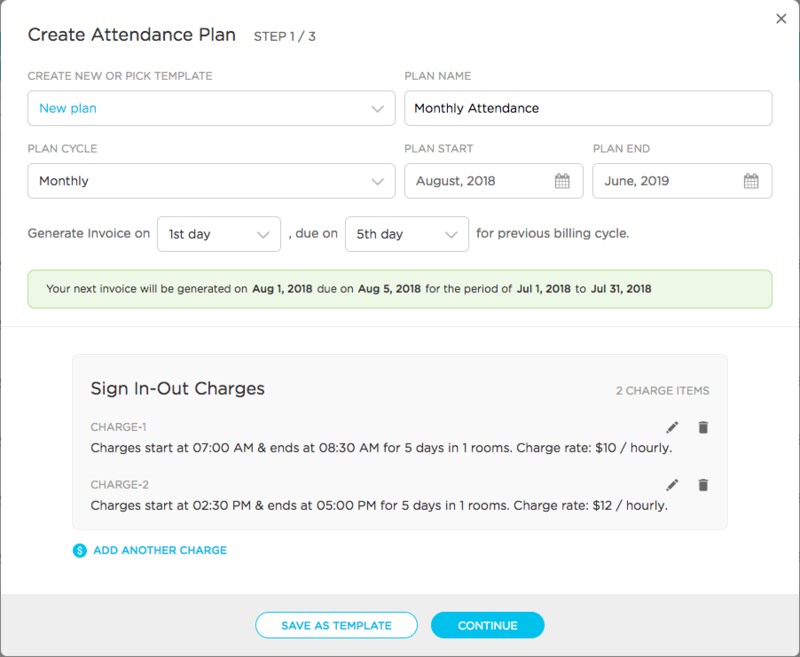 Attendance-based plans follow the attendance of the child throughout the billing cycle in order to apply hourly or daily charges. Students can be assigned one or both types of plans. To begin, go to Billing --> Recurring Plans and click on the "Create Recurring Plan" button. You'll see a drop-down menu and choose to create a tuition or attendance plan. Here is an example of a tuition plan that I've filled out. I'll take you through the fields one by one. 1 - Create New or Pick Template: Click on this drop-down menu to choose from saved templates (there is a sample template saved for your perusal) or leave it on "New plan" to continue creating your own plan. 2 - Plan Name: Each plan must have a name. If you have multiple charges (sibling rates, staff rates, half-day rates, infant rates, toddler rates, some weekly, some monthly, etc. ), we recommend naming it after those charges. If you only have one charge, naming it after the plan cycle is a good option (i.e., "Monthly / Weekly / Bi-Weekly Tuition"). 3 - Plan Cycle: Your options are monthly, bi-weekly, and weekly. If your billing cycle is different (like bi-monthly, yearly, or custom date ranges), we recommend creating manual invoices. 4 - Plan Start: This indicates when the system should begin sending out invoices with these specific charges. Pay attention to the green preview bar as you select these dates. 5 - Plan End: The system will stop sending invoices with these specific charges on the date you select. Again, view the green preview bar. 6 - Select your plan's invoice creation date, invoice due date, and billing cycle. If parents have enabled auto-pay, funds will automatically transfer to your bank account on the invoice due date. If you are choosing for a weekly or bi-weekly plan, please keep in mind that dates can be selected for Monday through Sunday of the same "week." There is no option to create an invoice on Friday and have it due the following Monday, or create an invoice on Monday and have it due the following Monday, etc. Billing cycle options include Previous, Current, and Next. The best way to see what these mean is by changing your plan to each one and seeing how the dates are affected in the green preview bar. 7 - The green preview bar displays information parallel to #6. As you determine the appropriate dates for your plan, the dates in this preview row will change accordingly. Add your charges here. The item description field is required, and both the description and the amount need to be filled out before you'll be able to click on the "Add New Item" button (circled in red in the image above). Click "Continue" to select the students you want to assign this plan to. You can use rooms and tags to narrow down the list if needed. You will only see students who do not have a tuition plan assigned to them yet. Once everyone is set, continue to Step 3. Double check that everything looks good. We recommend also checking the circle to save the plan as a template. 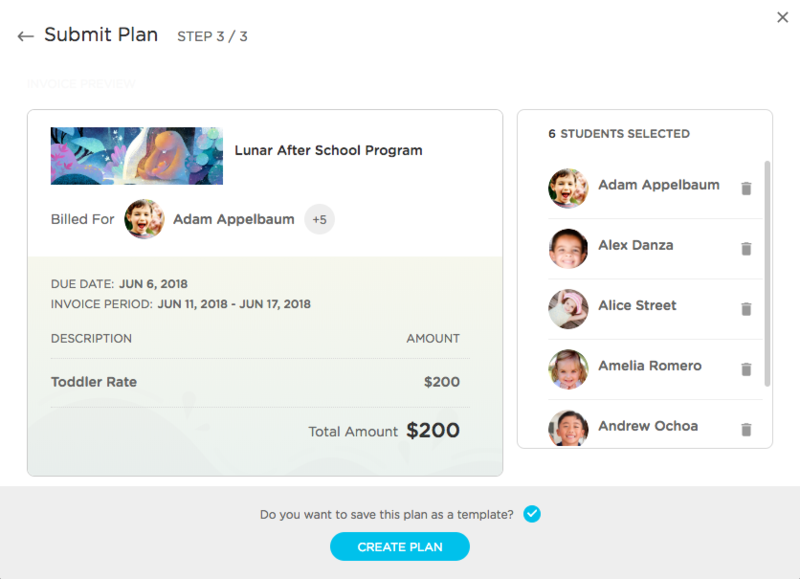 This will save time in the future when you need to assign the same plan to a new child, or when you want to edit the plan details and assign it to children whose original plan had ended (for example, at the start of another academic year). When you're ready, click the "Create Plan" button. These plans allow for room-based charges and late pick-up fees. Here is an example of an attendance plan. 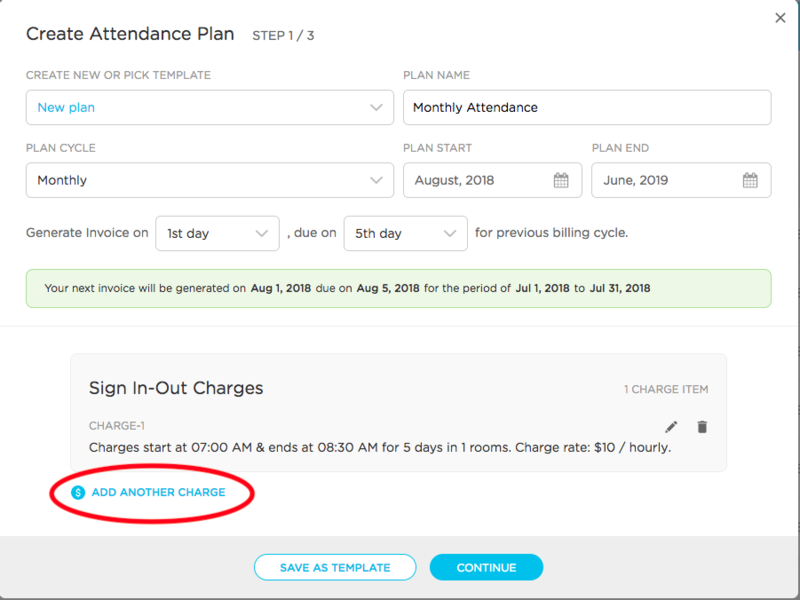 The main difference is that attendance plans ONLY allow you to bill for the previous billing cycle. In order for a child to be charged based on attendance, there needs to be attendance data in the system. 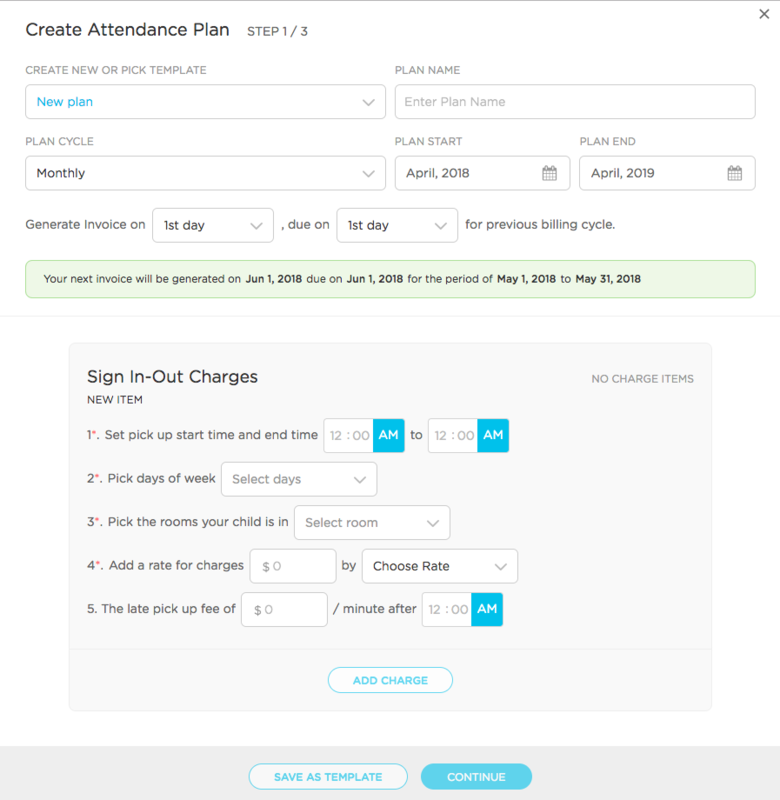 A single attendance plan can have as many charges attached to it as necessary. A student will not be charged unless they have actual attendance data that matches the parameters of the charge. For example, below I have filled out a charge for my before care hours. What this plan means is that any child who is signed into the room "Before Care" between the hours of 7am and 8:30am during Monday through Friday will be charged $10 per hour. Once I'm satisfied with the charge, I would hit "Add Charge." If I have more charges to add, I would click on the "Add Another Charge" button (circled in red below). Now I'll add my After Care charge. For this particular charge, any child who is signed into the room "After Care" between the hours of 2:30pm and 5pm, Monday through Friday, will be charged $12 per hour. Notice the late pickup fee highlighted by the red box above. This means that for any child who is NOT picked up by 5pm, I would charge the families $2 per minute. 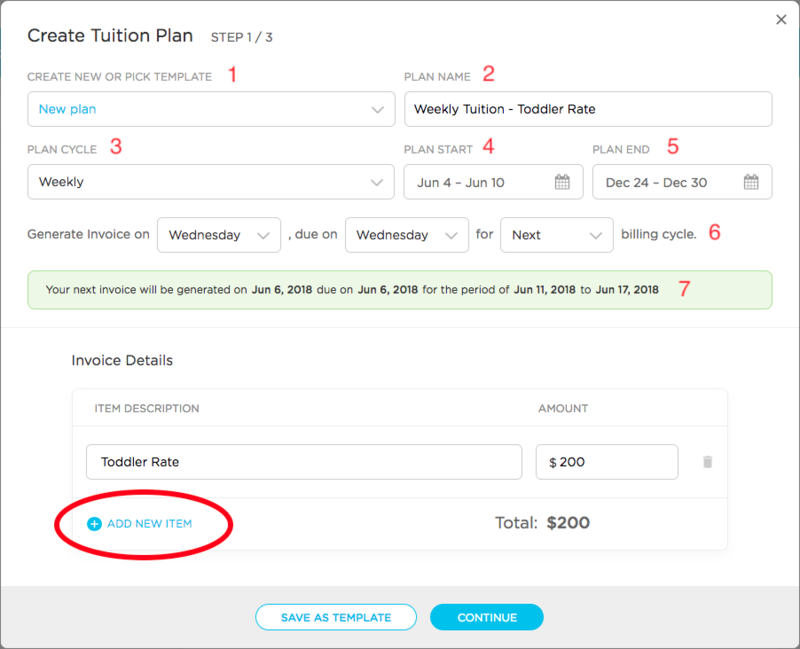 Once you're all set adding your charges, you will continue to steps 2 (select children) and 3 (review and create the plan), which follow the same format as the Tuition Plan above. 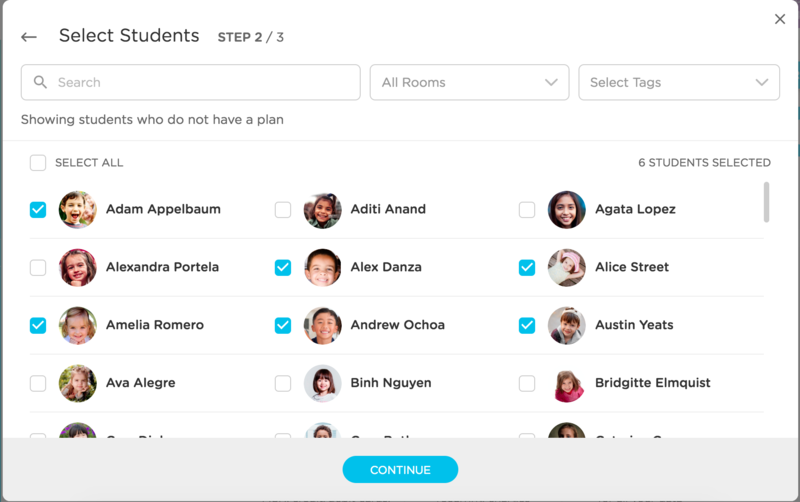 With the attendance plan, it is completely possible to assign different charges to the same room if the children will not be transferring to different rooms. 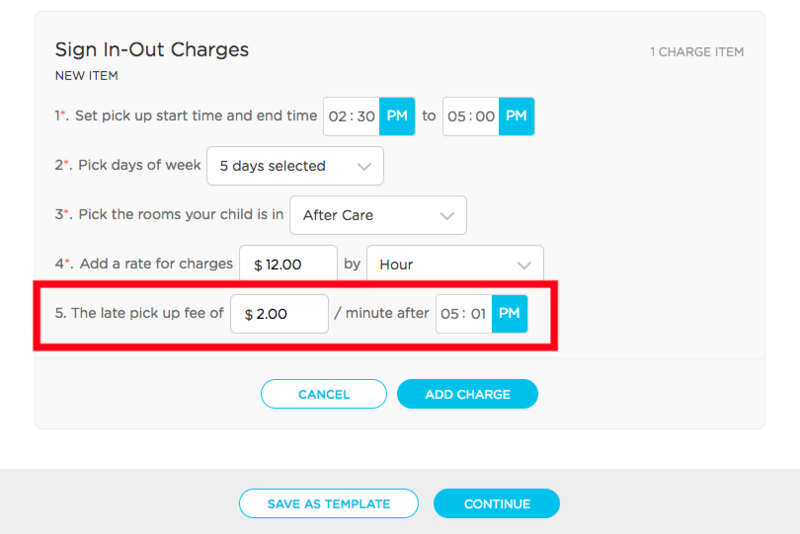 As long as the times for the charge are listed correctly, the child will be charged correctly on their invoice even if they stay in the same room from 7am to 6pm. After the plans are assigned, you can use the ellipsis to preview what the next invoice will look like, edit the plans charges, pause/resume the plan, or cancel the plan. When editing a plan that has already been assigned, you will only be able to change the charges, not the dates. You will need to cancel the plan and assign a new one to change a student's invoice dates.